While unrelated teammate Conner Smith grabbed most of the headlines for winning the individual AQHA High Point Open Rider trophy as well as team open western horsemanship, Alexander Smith of St. Andrews University (pictured) had a good IHSA Nationals debut last May. 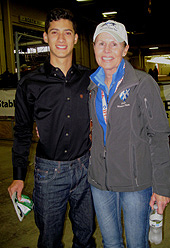 From Trinity, North Carolina, Alexander Smith was second in team beginner western horsemanship on May 5th. 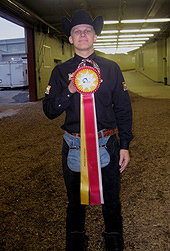 Smith is seen here near the winner's circle at the Pennsylvania Farm Show Complex after receiving his red ribbon. 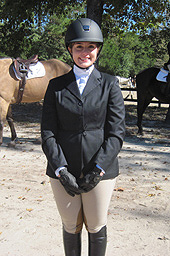 From Miami, Florida, Alex Grobman of North Carolina State University (pictured) finished in a tie for second place in the Region 3 hunter seat open rider standings last season. Both Grobman and Erica Hamilton of East Carolina earned 62 points which was four fewer than Sabrina Vlacich of St. Andrews. 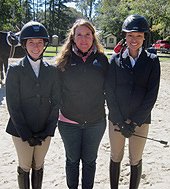 When this photo of was taken at the October 2015 UNC - Wilmington show both Grobman and Vlacich were intermediate riders and Hamilton was competing in another region for another team. Grobman was a winner in intermediate flat about an hour after this photo was taken at Old Homestead Farm in 2015. When she was fourth in individual novice on the flat at Zone 4 Zones last April 7th Scout Maddox of St. Andrews University (on left) probably thought she had taken her final ride for St. Andrews prior to graduating. But it turned out the senior from Dallas, Texas would in fact ride for the Knights at 2018 IHSA Nationals. A late change (after the Nationals program was printed) meant that Maddox would take the place of another rider in the team intermediate flat class on May 3rd. 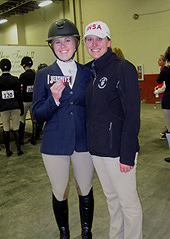 Maddox is seen here with hunter seat coach Robin Brooks after taking part in the horse draw for team intermediate flat (the name of the horse Maddox drew was taped to the back of the hershey bar she is holding). 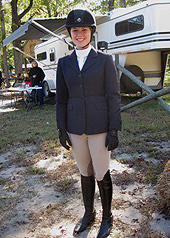 From Mill Spring, North Carolina, Lauren Wiltsek (pictured) was one of two University of North Carolina at Chapel Hill riders to compete at 2018 Zone 4 Zones in Greensboro on April 7th. 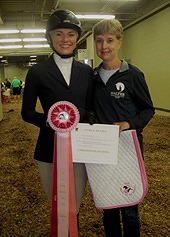 Wiltsek closed out her junior year by placing eighth in individual intermediate over fences at Sedgefield Showgrounds that day. St. Andrews University head coach Carla Wennberg (on right) wanted us to make sure we captured a picture of her team intermediate western horsemanship rider at 2018 IHSA Nationals. He is Marcos Nogueira (on left) and he traveled all the way from Brazil to compete for the Knights. St. Andrews earned team points in three of the six divisions, with Nogueira placing fourth to help the Knights tally 15 points in Harrisburg last May. A trip down memory lane! Back in October of 2015 Ginny Rollins (center) was the head coach at Duke University (today it is Haley Coble). At the 10/18/15 UNC - Wilmington show Rollins posed with Bonnie St. Charles (on left) and Kailey Johnson (on right) prior to the start of the show. From Los Angeles, Johnson would win the open flat class which started the show. From Chattanooga, Tennessee, St. Charles would finish fourth in the Region 3 hunter seat open rider standings in 2017-18 while also pointing out of open fences. Johnson and St. Charles would both finish inside the top ten in the Region 3 2017-18 hunter seat open rider standings, as Johnson was in sixth place only nine points behind St. Charles. Hannah Newman of St. Andrews University (on left, with her Mother) competed on the first day of 2018 IHSA Nationals and the fourth day but not in between. From Spartanburg, South Carolina Newman showed in both hunter seat novice team classes and team advanced western. As a result Newman can say she showed on the all-hunter seat day (May 3rd) and the all-western day (May 6th). Her best result came in the team novice flat class when Newman put the Knights on the board with a fifth. Newman had won the same division late in the day at Zone 4 Zones on April 7th to help St. Andrews win the Zones show outright with 39 points. Schools competing in Zone 4, Region 3 during the 2018-2019 school year: Campbell University, Duke University, East Carolina University, Elon University, Martin Community College, North Carolina State University, St. Andrews University, University of North Carolina at Chapel Hill, University of North Carolina at Charlotte and University of North Carolina at Wilmington. Several Zone 4, Region 5 schools and at least one Zone 4, Region 4 school show Western in Zone 4, Region 3. Show Schedule subject to change.